In the jungle of chain clothing stores & age of globalization, it is difficult to find a brand that is unique to Italy and even more to Milan, especially in the moderate price segment. JDC gives you both: a Milanese brand AND Milanese style. Spread over two floors, there is a large variety of men and women’s clothing. Target group is mainly young hipsters or the ones who at least feel like it. One thing is for sure: after you’ve shopped here, you will no longer be a stranger to the city, at least by the looks, which, let’s face it, makes up 90% of a true Milanese anyway. The shop features pieces of its own label but also a vast mix of other brands (you will also find known brands like Jack Jones) but it’s the selection that remains true to its style and all this without digging too deep into your pockets. 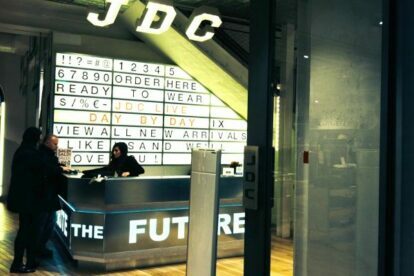 JDC has two shops in Milan, both located in the two major shopping areas. JDC Cathedral is on Corso Vittorio Emanuele and JDC Buenos Aires is on Corso Buenos Aires, which calls for a long shopping spree if you have the time.